Used Alfa Romeo 145 Review - 1994-2001 Reliability, Common Problems | What Car? What should I look for in a used Alfa Romeo 145 hatchback? The good news is that the galvanised bodywork keeps rust to a minimum. But, beware of examples that have a history of intermittent faults – the electrics can be suspect. Avoid cars with electrical gremlins that the seller tells you they just 'put up with'. The interior build quality is poor, too, so you can expect irritating rattles. Check the car has a good service history, and make sure you're aware of the cambelt change intervals. If you gamble on a car that has little or no service history, you may well end up making frequent trips to the local garage. Watch for smoky engines and listen carefully to the suspension. If you hear the odd groan or creaking as you drive, you can be sure a suspension repair – and a hefty bill – is just around the corner. To cut a long story short, if you're after bulletproof mechanicals, look elsewhere. The 145 never scored particularly well in Warranty Direct's reliability surveys, and Alfa Romeo was well down the list in a recent JD Power customer satisfaction survey. 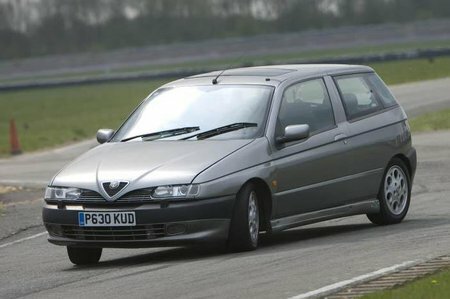 What are the most common problems with a used Alfa Romeo 145 hatchback? Is a used Alfa Romeo 145 hatchback reliable?